The restaurant was a regular haunt of me, and my tetralingual Romanian friend Patricia. The chefs were friendly, the sommelier liked to practice her French with Patricia. After a little bit of pleading, they finally gave us the recipe, and now I make it regularly. Don’t discard the marinating liquid, after the veggies are gone. It makes wonderful salad dressing, or a dip for bread. The only non-negotiable vegetable is the lotus root. It would be good, as well, with other vegetables like carrot, and maybe a little daikon. Heat a large pot of water on the stove to boiling over high heat. 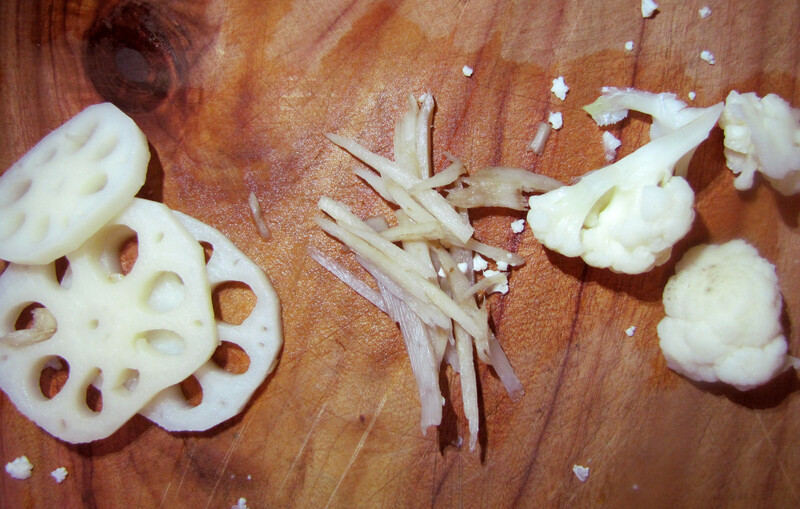 Meanwhile, peel the lotus root, and slice it into thin rounds (<1/2 inch, 1cm) thick. Peel the gobo and julienne it, into thin sticks about 2 inches (4cm) long. A mandolin is great for this. Break the cauliflower apart into bite-sized florets. Treat any other vegetable similarly, chopping it into convenient morsels. Blanch the vegetables, starting with the gobo. Add the gobo to the boiling water. 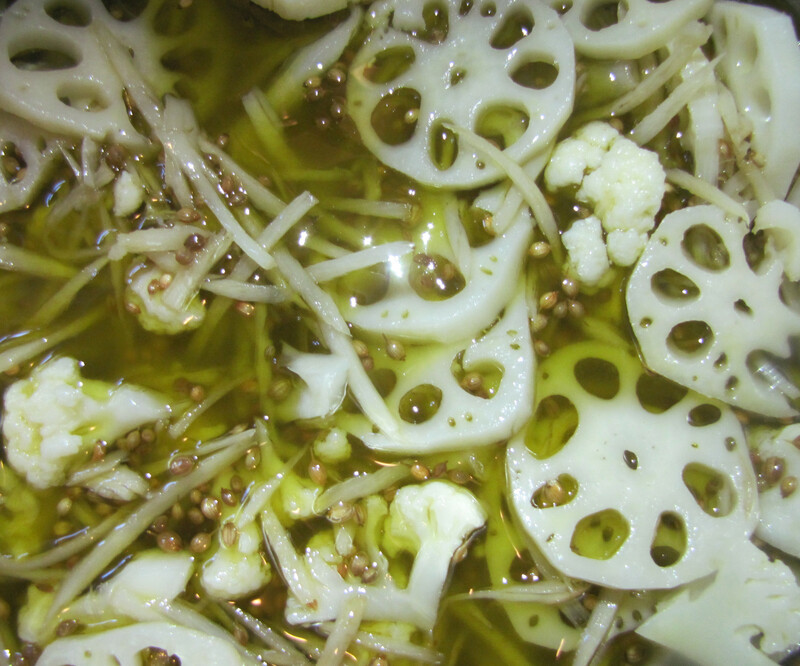 When the water is nearly boiling again, add the lotus root. When the water is nearly boiling again, add the cauliflower. Be careful not to overcook the cauliflower — it should still be crisp, not soft. It’s pretty hard to overcook lotus, and nearly impossible to overcook gobo, so they should be fine. When the cauliflower (and/or other vegetables) are just turning tender crisp, take the pot off the stove and rinse the vegetables in cold water. Put them in a strainer, and let them drain well. Then put them in a bowl, so you can toss them with the marinade. To make the marinade: in a small pot, combine the sugar, salt, vinegar and coriander seed. Heat it to boiling over high heat, and then take it off the stove. Mix the vinegar mixture (including all the coriander seeds) together with the vegetables. Add the olive oil, and toss it all together. Let the vegetables marinate overnight, and then put them in the fridge in a sealed container. They’ll be ready in about 3 days — and will keep easily for a month. In the fridge, the olive oil might become solid. This isn’t a problem, just let the pickles warm up to room temperature before serving. If the olive oil starts to run out in the marinade, add more.